I write to you this morning with a heavy heart. 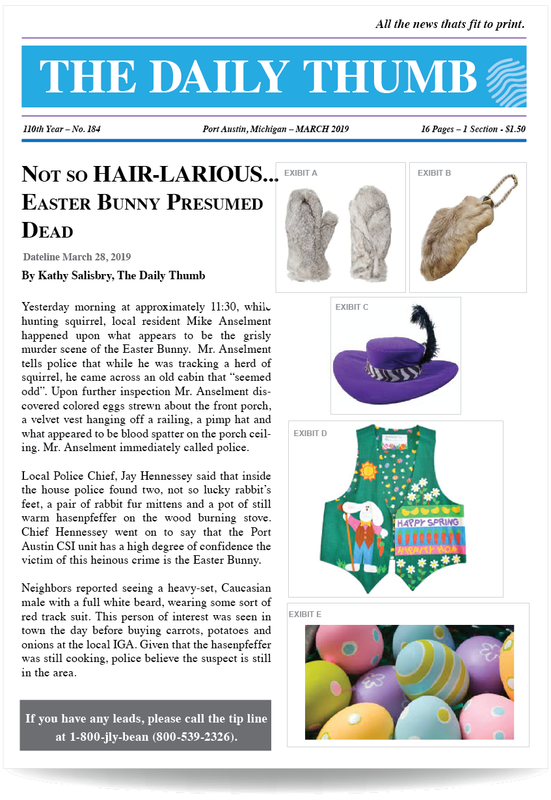 It has recently been brought to my attention that on March 27, 2019 in the small Michigan town on Port Austin, Michigan (a suburb of Pigeon) a local hunter happened upon the grisly murder scene of the Easter Bunny. Below a clipping from the local newspaper The Daily Thumb that tells the sad tale. So gentle reader, do not despair, JT’s Confections has all your Easter candy needs. SOLID Bunnies, Chocolate Covered Easter Marshmallows, Chocolate Covered Easter Oreos, Chocolate Covered Caramel Coconut Bites and Jelly Beans. In addition to our chocolate covered pretzels, caramels, toffee, barks and the world’s greatest pecan caramel clusters! If you love your kids, there is NO reason to be going to Rite Aid, Acme, Franks Cigar store or any other fraudulent candy dealer. Please visit us at 1206 Sussex Turnpike in Randolph and help your kids forget the Easter Bunny. Easter Who??? We are open every day until April 19th (Good Friday). Our hours are 10:00 to 3:00 every day.